I had my doubts when Ann told me she wanted to visit The Pioneer Woman Mercantile in Pawhuska, Okla. For me, I couldn’t see how this would be time well spent. 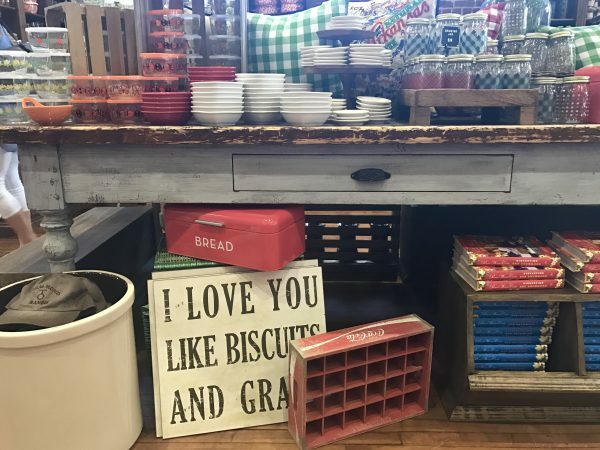 I envisioned a crowded store with mostly middle-aged women roaming around, oohing and aaahing at spatulas and cast iron skillets with the same starry eyes that middle school girls have at a Justin Bieber concert. As it turns out, I was not wrong. 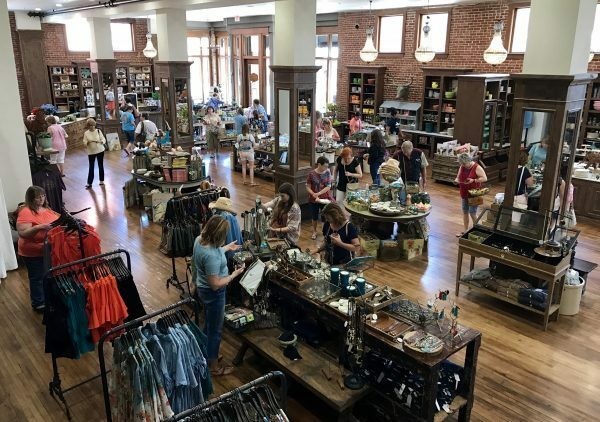 A view of The Pioneer Woman Mercantile from the staircase leading up to the second floor. Cinnamon rolls, pecan sticky buns, blondie bars, and cookies, all made with real butter. Just go to the bakery and settle in. You can thank me when you wake up from your carb-induced food coma. 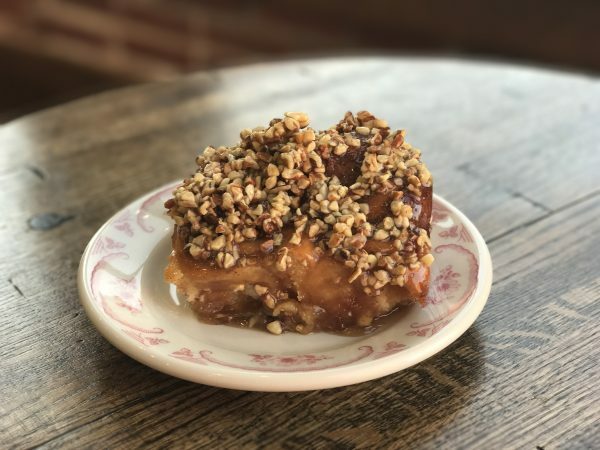 The Pioneer Woman knows how to bake, and this pecan sticky bun proves it. Let’s be honest for a minute, guys. Our wives do some great things for us and visiting The Merc (as Ree calls it) gives us a chance to do something nice for them. When we visited, we hoped to enjoy an early supper there. We pulled up and found a line stretching about 3/4 of the way up the block. I told Ann that she could go inside and have fun looking around the store and I’d stand outside in the line for a table in the deli. She took me up on it, and so I stood there for nearly two hours, gaining quiet hero status among my wife and the dozens of other women who comprised 88% of the people in line. And the best part? At the end of my wait, I sat down to a tall glass of blackberry tea and a plate of Ree’s chicken fried steak. It was a fork-tender, thinly sliced ribeye, breaded and fried to perfection, served with a side of delicious mashed potatoes, all smothered in creamy country gravy. I ask you, who came out the winner on this one? The chicken fried steak at The Pioneer Woman Mercantile tastes even better than it looks! 3. You’ll feel truly welcome. We pulled up in Pawhuska about 3:10 p.m. on a sunny, Oklahoma day in June. About two minutes after pulling my hero routine and telling Ann to go inside while I waited, I began to regret that decision as the sun relentlessly beat down on me and my bald spot. But then a nice young lady named Meg came along and offered me an umbrella and a bottle of water. 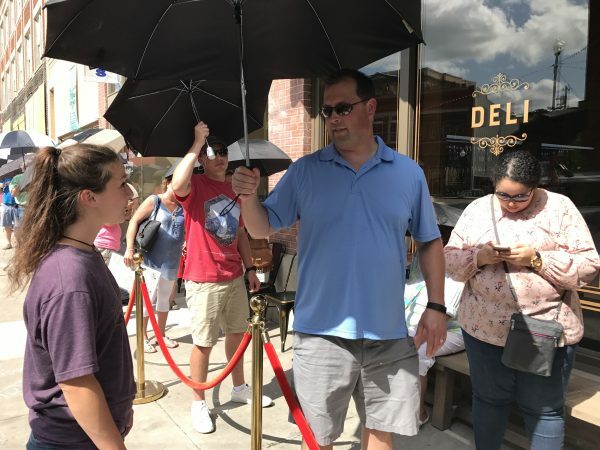 Steve visiting with Meg Kane while waiting in line at The Pioneer Woman Mercantile. And I stood, out of the worst of the sun, thirst quenched, chatting with others who were waiting, and had a really pleasant afternoon. All of this made me wonder, ‘What business does this sort of thing?’ This was not normal. It was far better than that — it was humanizing. The Drummonds actually care about the people who come to their store, and that’s pretty special. On the show, the Drummonds appear to be fairly normal and down-to-earth people that you think you’d probably like to get to know. While we didn’t have the chance to meet them, after visiting Pawhuska I’m convinced it is not just an act you see on TV. People in line told us they’d seen Ladd come out of his office which is upstairs near the bakery (lucky man). They said he doesn’t use a secret door. Instead, he walks up and down the stairs like everyone else, chatting with people and stopping to pose for pictures along the way. 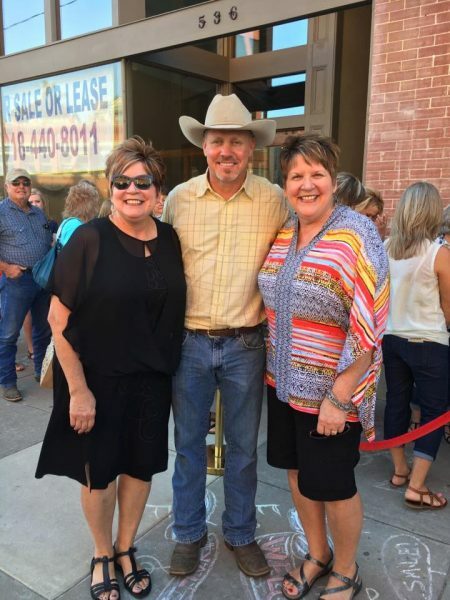 Corinne Nuss and her twin sister, Connie Scism met Ladd Drummond at The Mercantile on their visit to Pawhuska this summer. 4. The prices won’t break the bank. In creating The Merc, the Drummonds created a business to which hundreds of people flock daily. They could charge whatever ridiculous amount they wanted for the food and merchandise. And visitors would pay. In fact, this is what I expected — after all it happens nearly everywhere we go these days. But that was before I realized they believe their customers are people. The merchandise at the PW Mercantile is reasonably priced. The prices are completely reasonable. Ann, Meghan, and I each had dinner, some extra sides, and a bottomless glass of the best iced tea any of us had ever had for $64. Likewise, we picked up a few new things from The Merc that were also in line with pricing we see in other kitchen stores. It was obvious to us they are in this to share with their fans, not take advantage. 5. Charmin in the bathrooms. 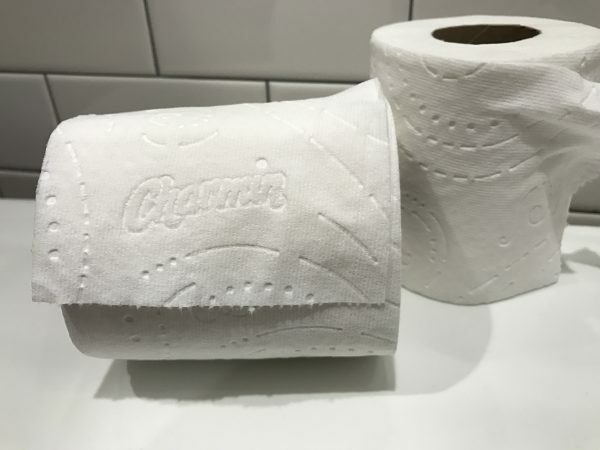 They have Charmin toilet paper in the bathroom. Real Charmin. I could go into details on why that’s a good thing, but I think we all know. When was the last time you saw Charmin in a public restroom? 6. You’ll love the food. Chances are, if your wife wants to visit The Merc you are already an unknowing fan of Ree Drummond’s. 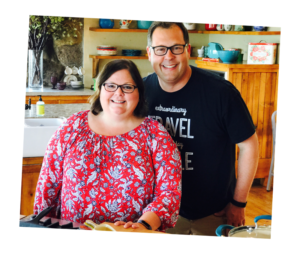 More than once I’ve complimented Ann on a delicious dish, only to find out that it came from one of our Pioneer Woman cookbooks. Spicy queso dip, warm tomato soup with parmesan crisps, chicken enchilasagna, and pan fried pork chops are some of Ree’s dishes. Yum. 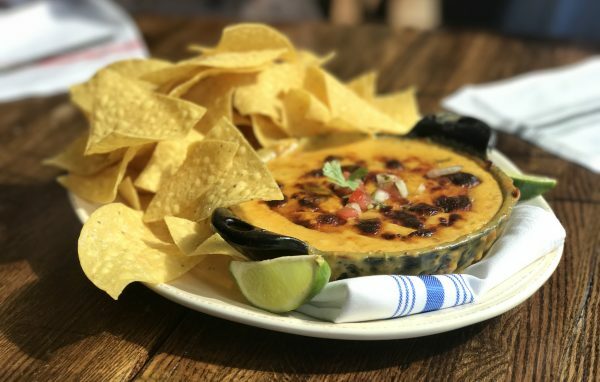 The Pioneer Woman queso dip was amazing, especially with the charred cheese on top. And, because of Ree Drummond, we always use real butter, and we always grate fresh cheese. Men, this is something you want to cultivate. Ree can flat out cook, and everyone, (women and men) can learn something from her. I’m sure I’ll likely return to Pawhuska someday. [Author’s note: we now own a house there.] In fact, just writing this blog post reminds me of those cinnamon rolls and makes me want to get in the car right now. I guess what I want to say is, men, if your wife says she wants to go to Pawhuska, don’t be afraid. Trust me — pack some loose-fitting pants and go! 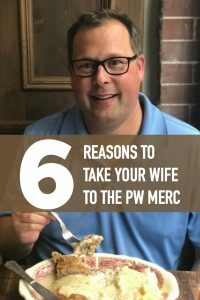 There are plenty of fun things for men to do while your wives shop. Click HERE to see the list. And if that isn’t enough, here’s a more complete list of 70 things to do in Pawhuska after eating at the Mercantile. Y’all just better plan a few days because the town is awesome! As always, thanks for sharing (especially with the men you know and love)! We hope you have a great trip and enjoy your time in Pawhuska. Make sure you plan a few days there…there are so many things to do! Search for our post on things to do in Pawhuska! It’s so nice to hear that people are going to Pawhuska to visit the Merc. I grew up there but haven’t had as much time to get back and visit like I would have liked. It was a great place to live and grow up. It was so sad to see it start dying and so many of the old buildings in downtown deteriorating. So glad Pawhuska is coming back to life because of all the Drummonds are doing. Hope to get there soon to see the changes that have taken place since I was there last. I was born and raised in Pawhuska. There is going to be lots to do on this 4th of July! Parades,lodge tours and fireworks among a few things. Visitors coming to visit, should take the short drive to Woolaroc park. It is well worth the extra drive! There is a drive through wildlife area and museum with some awesome art! There is really a lot to do and see in Oklahoma! Thank you for such a lovely write-up on the Merc and thank you all who have commented. It’s not every day such kind words are said about my family. I’m incredibly proud of my cousins and my hometown. If any of you do return to Osage may I recommend a 20 min drive to Hominy to visit the Drummond Home (http://www.okhistory.org/sites/freddrummond?full). in the opposite direction is the Frank Phillips Home in Bartlesville. Another attraction in that area of Oklahoma is Woolaroc, http://www.woolaroc.org/. All historical information can be found on http://www.okhistory.org/index.php?full. Thank you so much for your kind words. We are overwhelmed by the positive response we’ve had to this blog post. It is doing exactly what we hope our writing will do: inspire people to go places, including Pawhuska, Oklahoma. We hope to return to Pawhuska soon, and so also want to thank you for the suggestions in your post. We will have to check these places out. Know that we think your family is doing great things in and around Pawhuska–and they are assuring us that good things can happen to good people. Many blessings from our family to yours. That’s wonderful! You will really enjoy your time here. Please let us know if there’s anything we can do to help you out while you’re in town. My husband retires in December and we have a notebook going with a page dedicated to each state. The Mercantile was the first thing I listed on the Oklahoma page!!! 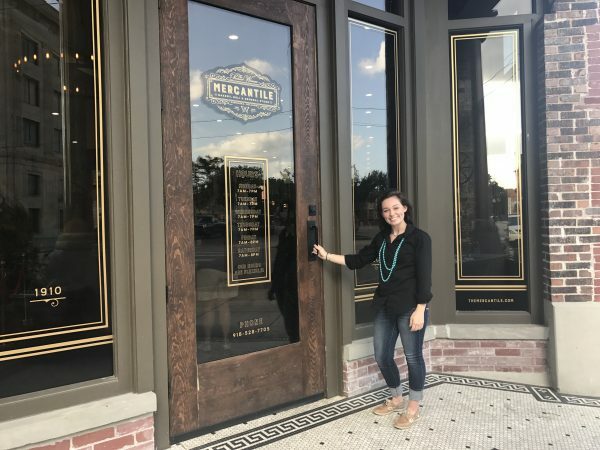 The Mercantile is a definite “must” if you visit Oklahoma. While there, the Oklahoma City Memorial is also well done–very moving and very powerful. Check out Beavers Bend State Park and Broken Bow Lake in Southeast Oklahoma! Hochatown, Ok has hundreds of luxury cabins, great restaurants and several brewerys and winerys like the famous Girls Gone Wine! Thanks for these suggestions, Stacey! We definitely have a lot more to see in Oklahoma. While in the Pawhuska area you must make time to for the Nature Conservancy’s Tall Grass Prairie. A Tall Grass Prairie is the unique ecosystem which once dominated from he Southern Plains up to the Northern Plains. Very little is left and the TGP is the larges intact area of this unique ecosystem. You will see wild bison. Thanks for the suggestion! We have a tall grass prairie near us in Nebraska, but it is only a few acres in size…we would definitely want to see the one near Pawhuska. Plus, we love bison! We will definitely put this on our list. Number 7…the coffee. I had mine iced. Best coffee I have ever had. We liked the coffee, as well. In fact, Ann said that if we lived in Pawhuska, she’d go every morning for a cup of the Cowboy Coffee. My girlfriend and I along with our husbands made a 4 day trip out of our visit to the Merc in Pawhuska. What a fabulous trip! We flew in from California and spent a whole day at the Merc having breakfast in the bakery and lunch in the cafe downstairs. Food and service was fabulous! Our hubbies carried our purchases and were such troopers while we shopped and reshopped. We met nice people in all the local shops we visited around town as well. We took in the sights of the Tall Grass Prarie to visit the fabulous buffalo preserve a short drive from downtown Pawhuska. The next day we were able to visit Kansas, Missouri and Arkansas stopping at antique stores along the way. A full and fun day before returning to Oklahoma for our last night. Flew out the next day for home. A wonderful trip! Wow! You had a great vacation and it sounds like your husbands love you very much! Thanks for sharing and following along. We were at the Merc in late May and loved it. I was also very impressed with the Charmin in the restroom. ? It’s the little things, isn’t it? Thanks for sharing and following along. Sounds like a wonderful husband! May God continue to bless you and your marriage. We drove 13 hrs frm southern indiana just to go to the lodge an mercantile. We had a wonderful time. Ate the fried pork chop breakfast. Got to met an take pictures with ladd. An got to met papa chuck ladd dad. Very very nice ppl.very dwn to earth. Ree was in new york. Went to the lodge an I stood where ree cooks an films her show. Went back stood in line for dinner. Had tomato soup ann grilled cheese dippers. An their hot prune cake an ice cream. It was delicious. It was best girl trip of my life. We saw wild horses. Buffalos. Absolutely loved it all. So glad you had such a wonderful experience in and around Pawhuska! We can’t wait to go back. I love your blog and all the nice things you say about Pawhuska and the Merc. I. Live in Pawhuska and love it. I know the Drummond’s. I have known Ladd since he was A little boy they really are nice people. We love all the visitors to pawhuska and hope you come back many times. You’re too kind, Jo (just like everyone else we met in Pawhuska). We are hoping to bring our moms to Pawhuska and hopefully sooner than later. Such a sweet town and some of the most hospitable people met in all our travels. Thanks for following along! We always stop to or from Texas on our way back to Wisconsin. Ladd is great to visit with and the store is beautiful. Seems like Ladd is there fairly regularly. So glad you’ve enjoyed your visits. My husband and I visited the mercantile in late May and it is everything you discribed. I had the chicken fried steak and my husband had the pork chops. delicious! Plus we got to meet Mr Drummond. Such a nice person, just like he seems on their show. We will go back. So cool that you got to meet Ladd! My daughter and husband have been there twice in 2017. Ree and Lad sat down with them while eating Dinner and also took pictures. In June they came back from Illinois and took a tour of the Lodge. It was beautiful and homie. They went for there big breakfast too. 4 meal in total so far. I’m ready to go myself now. Was Ree every week on her show. The lodge was amazing and we were so grateful to the family for opening it up to visitors. Truly a unique travel experience. We’re going in September! lol I had to laugh… Ree’s the reason I grate cheese, eat candy bar ice cream pie for Sunday dinners, and yes… real butter! Love it! You will have a great time there. We just took a wedding trip (with another planned for August) to Texas from Tennessee, Both I and My daughter checked to see how out of the way it would be to go to The Merc. 7 hours we honestly cant afford to go-HUGE DARN IT!!!!!! Well its on the list for the future, and I expect the wait will be worth the trip. It was about a six hour drive for us and so worth it! I hope you’ll be able to get there someday. Thanks for your nice comments and for following our travel blog. Love your story! My husband did too. I think he’s ready! Love this story!!!! Hope to get there someday. Definitely on my bucket list!!!! Thanks, Robin. I hope you get there someday. It is such a great place to visit and there’s actually quite a bit to see and do in Pawhuska. Let us know if you make it there. We’d love to hear from you. truly enjoyed reading about your experience there. wish I could get there, maybe someday. I live in Virginia and watch and tape all of Pioneer Woman episodes. I have her cookbooks also and love her Chicken Spaghetti which I have made numerous times. I also love Chicken Fried Steak and make that often and also make Ladd’s favorite sandwich. Thanks for your nice comments, Mary. 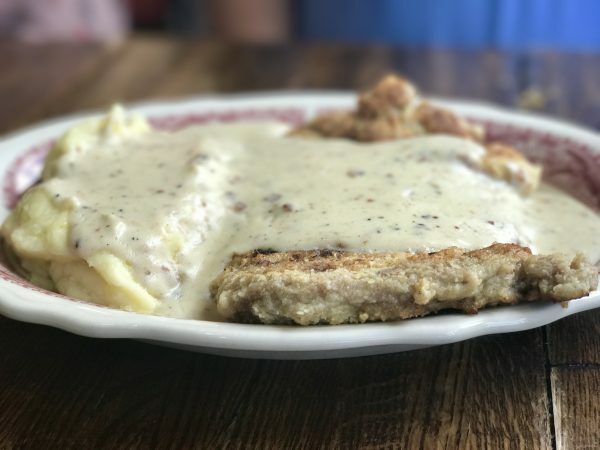 Steve has had chicken fried steak many, many times and said Ree’s is definitely his favorite — hands down. When we were there, the chicken spaghetti was available at the Grab & Go counter and it looked amazing. So much food … so little time. Thanks for following along. LOVE the story and totally agree with it all. Thanks for your nice comment, Karen. We have a few more posts coming soon, including one I think you’ll enjoy about our visit to the lodge. Thanks for following along.